Trust your next bathroom remodeling job to the experts at Bradley Construction. We’ve been remodeling bathrooms in the Gaithersburg, MD area for over 35 years. A typical small bathroom remodeling job includes new flooring and shower tiles, new vanity sink and toilet. 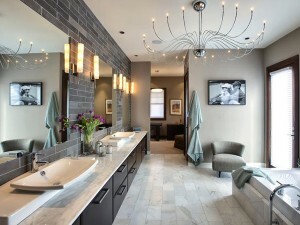 Bradley Construction also has a majority of experience with large scale bathroom remodeling. We can add square footage to your current bathroom in addition to moving sinks and toilets. Our design will go over all of the details including tile, vanity and counter top choices.We’re flexible and value oriented. We use the latest in CAD and design software to come up with a rough floor plan & elevation view of your project. Have you considered newer water-saving fixtures? (You can still obtain a water rich environment with water-saving features. Bradley Construction – Bathroom remodeling in Gaithersburg MD since 1978.